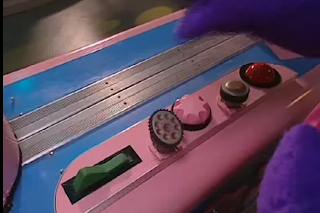 This is the control panel. Would you know what buttons to press and in what order? You wouldn't. 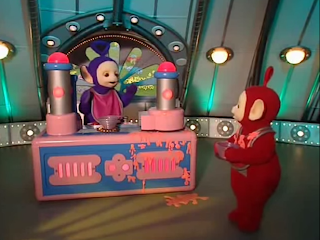 Tinky Winky also struggles, as the mapping between the buttons and machine's behavior is unclear. Although the machine is technically advanced - for example, it automatically detects when you take away the tubby custard bowl - it requires a lot of attention from its operator. Here are some suggestions. Note that they don't consider possible other functions of the machine as well as maintenance and accessibility requirements. For example, the second button from the left looks like the head of the tap. But it actually retrieves a bowl from the machine. To communicate this, the bowl should be depicted on the button. The second button from the right lowers and raises the tap. Implementing it as a toggle would allow it to represent the two possible states the tap can be in.